Pawleys Island, South Carolina, is a town that enjoys a thriving summer community. It is a place that grows from 100 or so year round residents to over 5,000 visitors and residents during the summer season. Ensuring the safety and protection of the community are the dedicated members of the Pawleys Island Police Department. Although the town’s unofficial motto is “arrogantly shabby“, the police department is proud of its professional law enforcement image. 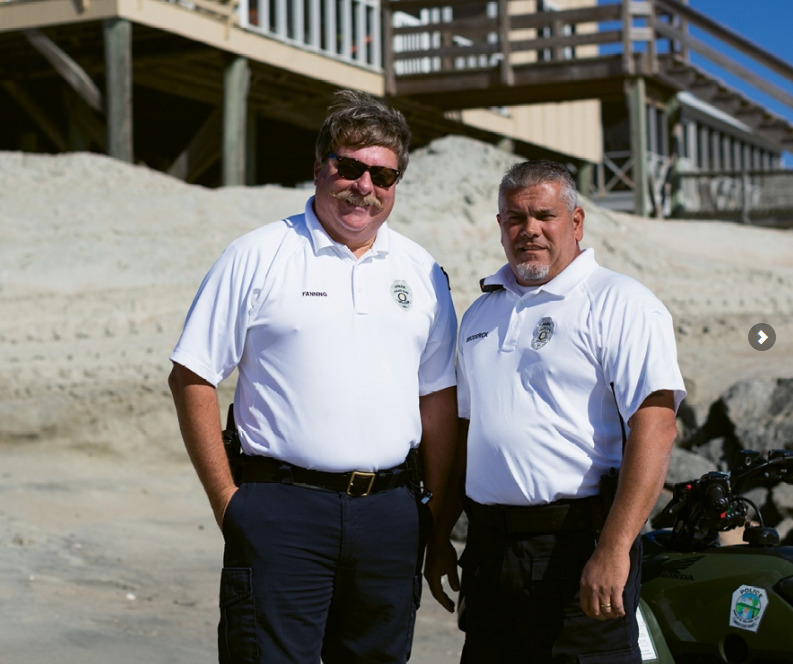 The Pawleys Island Police Department was created in 1993 with a chief, two officers and one vehicle. Since then, the department has expanded to include a chief, four full time officers and four part time officers. Currently led by Chief Michael Fanning, the officers patrol the 3.8 mile barrier island, its beaches and surrounding waters with three 4×4 vehicles, an all-terrain vehicle and a personal watercraft. The department’s personnel have over 150 years of combined law enforcement experience between them. This experience is widely varied from command staff through investigations including previous assignments in Georgetown County, SC State Transport Police, Ohio Twp (PA), US Border Patrol, US Mint Police, and New York City Police Department. We hope you enjoy your visit to Pawleys Island and please let us know if there is anything we can help you with. It is the mission of the Pawleys Island Police Department to preserve the public peace, prevent crime, detect and arrest violators of the law, and protect life and property. We will uphold the Constitution of these United States, enforce the laws of South Carolina and the ordinances of the Town of Pawleys Island. Office Hours – Town Hall is open from 8:30 AM to 5:00 PM Monday through Friday. The Police Department office is not always staffed full time although there is always an officer available for emergencies. In An Emergency Call 911, for all other information inquiries call Town Hall (843-237-1698). If you need to speak with an officer immediately call 843-237-3008 and the dispatcher will contact one. Parking – There is a limited amount of parking on the island, so please plan your trip accordingly. Parking regulations are strictly enforced. Here is a list of public parking and beach accesses. – Georgetown County Lot located at the south end of Springs Avenue. In addition to these parking locations, there are certain areas where you may park your vehicle along the side of the road within five (5) feet of the edge of the pavement unless otherwise posted or restricted. NO VEHICLES MAY PARK ON THE PAVEMENT IN THE RIGHT OF WAY. Town Court – The Town’s court is held the third Wednesday of each month at 5:00 PM at the Pawleys Island Town Hall, 323 Myrtle Ave, unless otherwise noted on the summons. Please check the ticket to verify. Fire Permit – Open fires are prohibited, however you may obtain a permit at town hall for a fire pit on the beach under following circumstances. No free-standing barbeques are allowed on the beach, charcoal fires only in a hole dug in the sand. Absolutely no open flames. Permit holder is responsible for any damages caused by the fire. No fire permit will be issued within 5 houses of a marked sea turtle nest. Permits are free of charge. All town ordinances can be found here. Fireworks – Absolutely No Fireworks are permitted on the island. Tents & Chairs – There are no restrictions against open sided tents. Please remove your tents, tent frames & beach chairs when you leave the beach for the day. We also ask that you fill in large holes in the Sand. These items impede the nesting process of sea turtles. Surfing – Surfing is not restricted to a particular section except within 100 yards of the pier under SC Code 50-21-180. Surfing is also prohibited by law between sunset and sunrise (50-21-820). Surfers are also prohibited by law to engage in conduct that endangers others (50-21-840a) which includes surfing too close to swimmers. Town golf cart permits can be obtained at town hall during business hours. Please bring your registration and proof of insurance. There is a $10 fee. Decals are good for one calendar year. Dogs and other pets must be kept on a leash at all times while outside of private property. This includes the beach. Handicap Wheelchair – Through the hard work of a local Eagle Scout, a beach accessible wheelchair is available at the south end lot. A signed release is required to use the wheelchair. The form can be obtained at town hall. Crime Prevention – To ensure that Pawleys Island remains a very safe place, we would like to make it less inviting to thieves and criminals. Please be aware that many areas of the island are under video surveillance. We ask that you lock your vehiclesat all times and do not leave any items of value in view. Please secure doors and windows of residences whenever possible. Store bikes, kayaks and other valuables in a safe and secure place. Homeowners are encouraged to contact the police department for a security survey and may request to have your residence placed on a special watch list during the off season.